BRIGHT LIGHTS | Pro Chem, Inc. 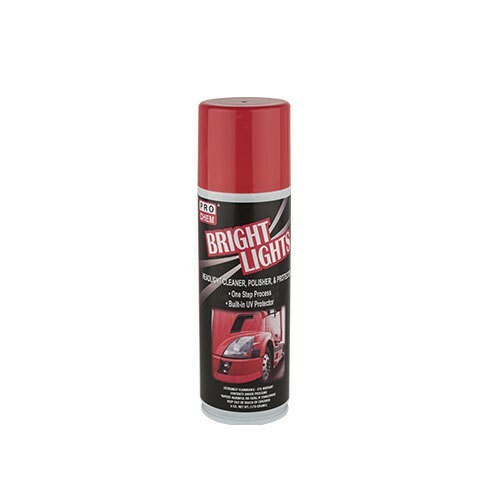 BRIGHT LIGHTS contains a thick cleaner that removes films, dirt and UV damage along with the everyday grime that attaches to plastics outside of the car. It completely removes all yellow, UV lines, acid rain spots and all minor scratches from the headlight carbon plastic units. Also safe on plexiglass and taillights. Remove protective cap and shake can thoroughly. Tilt can upside down and apply a heavy strip of BRIGHT LIGHTS to the headlight protective plastic lens. Let the foam set up for 30 seconds then rub the foam into the lens, using a up and down and side to side motion. Let sit for another 30 seconds. Product will haze up. This means that the product is working. Wipe off with a clean cotton cloth, applying pressure in an up and down and side to side motion. Apply a second coat. Repeat steps 3 and 4. After the product sits for 30 seconds wipe the dry product off using a up and down and side to side motion, and then finish the process with a micro fiber cloth, buffing the headlights to a fine gloss shine.